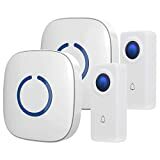 Wireless doorbells, which started gaining popularity about 20 years ago, are a cost-effective, easy-to-install alternative to the traditional wired doorbell. They are a great option when remodeling your home yourself as there’s no need to handle complicated electrical wiring—you just attach the doorbell with double-sided tape or screws and place the receiver somewhere inside your home. Since there’s no wiring, these doorbells are portable and a great option for people who rent their homes. In this shopping guide, we’ve broken down all of your options in order to make selecting your new wireless doorbell easy. 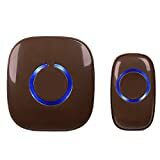 Wireless doorbells come in battery powered and AC or DC electrical models. 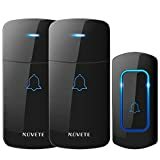 All wireless doorbells must be able to reach their receiver via radio signal, but there are long-range models that work over greater-than-average distances. 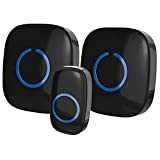 Finally, wireless doorbells can make a variety of noises—basic ones just buzz, but some can play multiple different chimes or tones. Battery Powered: Most wireless doorbell units are battery powered. Some use standard AAA or D batteries, and some are even rechargeable (great if you’re environmentally conscious). 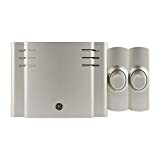 AC or DC Electrical: AC or DC electrical powered doorbells are another good option, although you must make sure there’s an electrical outlet nearby. 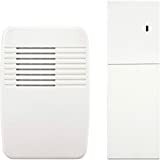 Long-Range: The average wireless doorbell must be within 250-500 feet of its receiver in order for it to effectively send radio signals to the receiver and make noise. 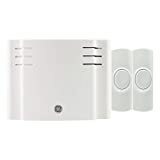 However, long-range wireless doorbells operate at 1000 feet or more from their receivers, making these an excellent option for folks with large homes. 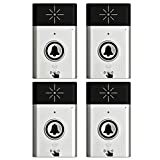 Multiple Chimes: Standard wireless doorbells have the option for a couple different buzzing sounds, but there are also doorbells with multiple chimes on the market. These play as many as ten different chiming patterns, and some even play music or holiday-specific greetings. Range: Consider the square footage of your home before purchasing a wireless doorbell, and make sure that the doorbell’s range is appropriate for the size of your home. If you spend most of your time in a room far from the front door, you’ll probably want the doorbell’s receiver to be located there. Easy Installation: Shoppers wrote rave reviews about wireless doorbells that had clear directions and were easy to install. Pre-programmed models were popular, as were units that could be hung up with double-sided tape. Weather-proof: Finding a weather-proof wireless doorbell was especially important for people whose front doors are exposed to the elements. Many doorbell units specify that they can stand up to rain, snow and temperature changes. 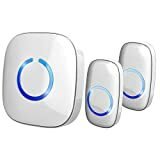 Interference: Some wireless doorbells have self-learning code systems that work to eliminate interference from other radio signals. 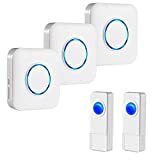 Customers reported being very pleased with these; blocking interference was especially important for people who live in neighborhoods or cities. Consider what your door is made of when buying a wireless doorbell. The doorbell’s range can be limited by metal doors, so you might need to buy a long-range unit. If you have a baby or small children, look for a doorbell with adjustable volume so you can turn the sound down or off while they nap. The physical appearance of your wireless doorbell is important too; make sure to look at a wide selection in order to find one that matches the aesthetics of your home. If you’re eco-conscious, look for a doorbell that connects to AC/DC electricity or uses rechargeable batteries. Look for a doorbell with a lighted button so that your guests can find it easily in the dark. Honeywell: Honeywell is a trusted name in home energy, safety, and security products. They even manufacture aerospace and defense technologies, so you can feel confident that their products are reliable! SadoTech: This company, based in Chile, is known for its affordably priced technology. They manufacture a wide variety of electronics. Heath Zenith: Since the 1980s, Heath Zenith has created and distributed quality products focused toward the do-it-yourself market. Their intelligent lighting and connected-home technologies can be installed by even inexperienced DIYers.